KATHMANDU, March 27: Nepal International Trade Fair, organized by the Federation of Nepalese Chambers of Commerce and Industry (FNCCI) in coordination with the government and local stakeholders, is set to begin on Thursday. The fair, which concludes on April 1, coincides with the Nepal Investment Summit. 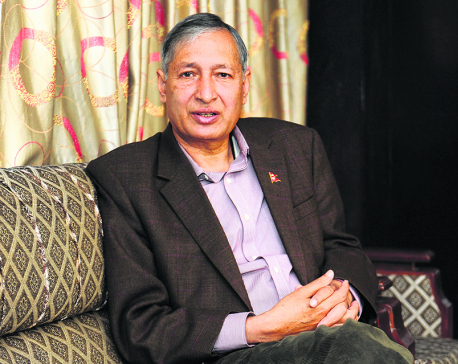 In a press meet organized Tuesday, FNCCI President Bhawani Rana stated that the main objective of the fair was to promote Nepali products, reduce import, and increase export. The fair is to be organized as a calendar event to draw national and international consumers and promote Nepali products regionally and internationally. President Rana said: "By coinciding with the investment summit, we will be able to draw in foreign entrepreneurs participating in the summit to our trade fair as well." Chairperson of trade fair organizing committee Dil Sundar Shrestha said that the last stage of preparation for the summit has finished. Of the total 225 stalls, 90 are Chinese, 10 are Indian, 40 Bangladeshi, and the remaining are Nepali stalls, where national and international products and services are to be displayed. The stalls will showcase products and services related to handicrafts, tourism, communication technology, agriculture, construction, and education, among others. Participants from Nepal, China, Pakistan, and Bangladesh among others will take part in the event. The organizers expect that 100,000 participants will attend this year's event. Chinese entrepreneurs arriving on Friday for the trade fair will be holding broad meeting and sign a letter of intent for future business talks and prospective joint investments. 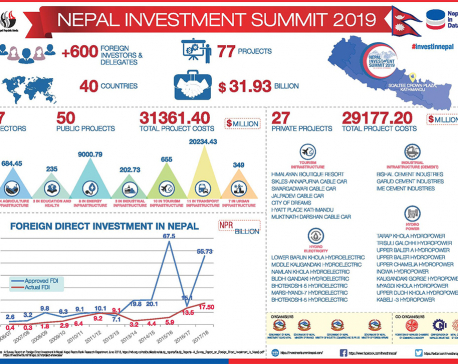 The fair is expected to play an important role in attracting investments from regional, national, and international investors into Nepal. It provides a platform for discussion of bilateral business ventures and investments along with providing a platform for active and direct interactions among participants. The fair aims to establish the Nepali market and promote it at international level and make Nepali products well-known to a broader market that is not limited to locals.